Crunchy snow peas, also called mangetout in China, are an essential part of Chinese cuisine. 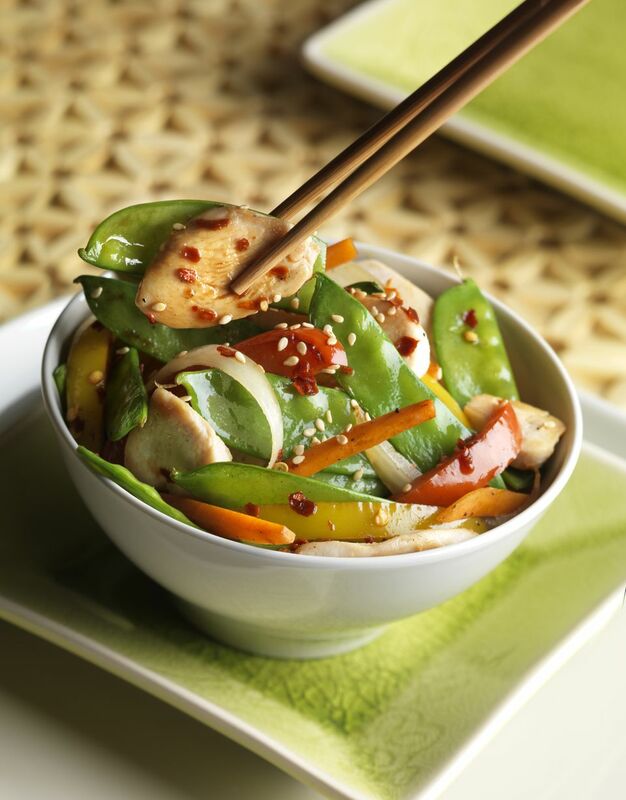 In this recipe, they combine nicely with tender, delicately marinated, chicken to make an easy stir-fry packed with Chinese flavors. This is sure to be a hit. Cut the chicken meat into large cubes. Add the marinade ingredients, adding the cornstarch last. Marinate the chicken for 20 to 30 minutes. While the chicken is marinating, prepare the sauce and ingredients. In a small bowl, combine the sauce ingredients, whisking in the cornstarch. String the snow peas, rinse and pat dry with paper towels. Heat the wok and add 1 1/2 cups oil. When the oil is hot, add the chicken cubes. Blanch in the hot oil for about 30 seconds, using a spatula or long cooking chopsticks to separate the chicken cubes. Remove the chicken cubes and drain. Remove all but 2 tablespoons oil from the wok. Add the salt. Add the snow peas. Stir-fry until the snow peas turn bright green (about 2 minutes). Add the chicken back into the pan. Give the sauce a quick re-stir and add in the middle of the wok, stirring quickly to thicken. When the sauce thickens, mix everything together. Heat through and serve hot.